As the administration and congressional leaders work on a framework for Republicans' top fall priority, how to pay for it remains the thorniest issue. WASHINGTON — White House officials trying to jump-start work on Republicans’ top fall priority – tax cuts – are coming up against the same obstacle that has vexed President Trump all year: divided Republican lawmakers. Trump advisers and top congressional leaders, hoping to assuage conservatives hungry for details, are working urgently to assemble a framework that they hope to release next week, White House aides and lawmakers say. But after months of negotiations, the thorniest disagreement remains in view: how to pay for the giant tax cuts Trump has promised. Negotiators agree with the goal of slashing the corporate income tax rate and also cutting individual income taxes. But they have yet to agree about which tax breaks should be cut to pay for it all. In private talks, Trump advisers are pressing to eliminate or reduce several popular tax deductions, including the interest companies pay on debt, state and local income taxes paid by families and individuals, and the hugely popular mortgage interest deduction. Several officials from the White House and Capitol Hill confirmed that those options are being considered – and that they are pushing to release broad outlines in about a week. But that is where the agreement ends. Congressional leaders, for instance, believe the mortgage deduction is too popular to cut, according to several officials familiar with the discussions. All of it has forced negotiators to consider scaling back their vision. And that is before any plan has even been presented to the rank and file. White House officials are still hopeful that they can lower the centerpiece of their effort, the corporate rate, from 35 percent to 15 percent. Many congressional Republicans, however, think that goal is ambitious. House Speaker Paul Ryan, R-Wis., said at a forum hosted by the New York Times last week that individual deductions for mortgage interest, health insurance premiums and charitable donations should all be preserved. “We see those more as broad-based, important things that should be encouraged,” he said. That leaves negotiators with limited options to pay for the tax cuts they all seek. Underlying the whole endeavor is the unresolved tension over whether it will constitute the sort of “tax reform” that Ryan has championed for years – an effort to reduce rates while maintaining federal revenue by eliminating “loopholes.” A straight tax cut, meanwhile, could leave the loopholes intact but add trillions of dollars to the national debt. Ryan and GOP allies have long promised “reform” in the spirit of the bipartisan 1986 rewrite of the tax code, which after three decades of revisions allows individuals and corporations to claim more than $1.6 trillion in tax breaks each year. But in recent months, key players have discussed something closer to the temporary, deficit-exploding tax cuts pushed by President George W. Bush in his first term. The White House and Republican leaders are trying a different approach than they used with the failed effort to repeal the Affordable Care Act, hoping for more agreement upfront rather than risk late defections that doom the entire process. Marc Short, the White House legislative affairs director, said administration officials have met with “more than 250 members,” including Democrats, to discuss tax reform. “Our outreach has been extensive,” he said. 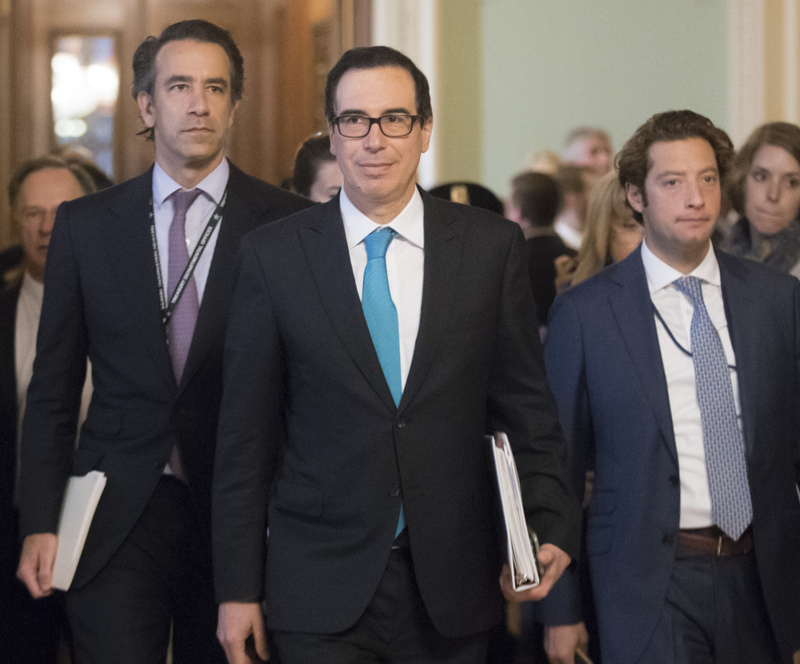 National Economic Council Director Gary Cohn and Treasury Secretary Steven Mnuchin huddled with key GOP lawmakers on Capitol Hill on Tuesday afternoon to discuss next steps on the budget and taxes, according to Republicans familiar with the plans. They discussed plans for a 2018 budget blueprint – a necessary first step before tax legislation can be taken up. And they drilled down with House and Senate negotiators on tax cuts. Mnuchin also told a conference in New York on Tuesday that negotiators were still considering a number of unresolved issues. He said, for example, that they had not decided whether to cut tax rates for all 2017 income or just income in 2018 and beyond. He also said Republicans would assume that their tax cut plan would create hundreds of billions of dollars in new revenue just based on economic growth, an assertion that many budget experts have said is suspect. Mnuchin also suggested Tuesday that companies could be treated differently under the Republicans’ tax proposal. He said, for example, that he favored charging a higher tax rate for accounting firms as opposed to manufacturing firms, which he says create jobs. Still, congressional Republican leaders are planning to use special budget procedures that would allow them to pass the tax bill with only Republican votes, skirting a potential filibuster from Senate Democrats. But they have made little progress in passing a key prerequisite, the budget blueprint, thanks to partisan infighting. In the House, hard-line conservatives have demanded a more detailed tax plan before ponying up votes for a budget, which has created a chicken-and-egg problem for GOP leaders. In the Senate, the complication is a Budget Committee where Republicans have a single-vote majority, empowering any single GOP senator on the panel to negotiate the parameters of the tax bill.